The second British attack on Point 206 was launched from east of the position by a battalion of the Queen's Own Cameron Highlanders (marked 3/11 on the map) and a detachment of Matildas (SQ-B, i.e. 'B' Squadron, 4th Royal Tank Regiment). 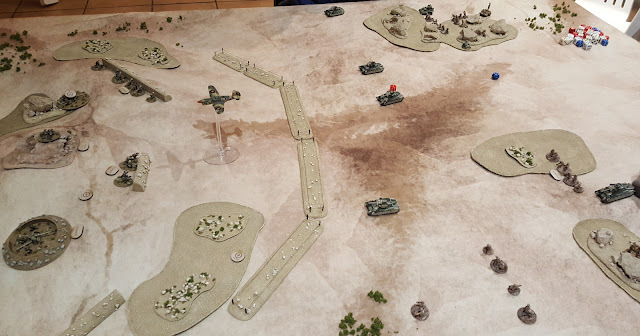 The combat points here were more even, thus both sides would field 400 pt forces and play the same mission on a slightly altered table: another German strongpoint needed to be taken in another sector of the Pt 206 defences. The German defences, slightly strengthened with a couple of minefields placed on their left. 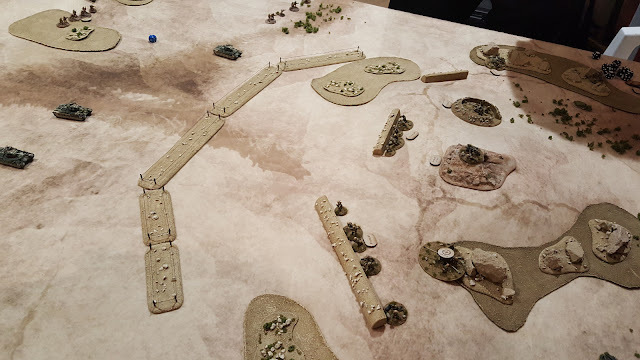 The British *again* attack on a broad front. 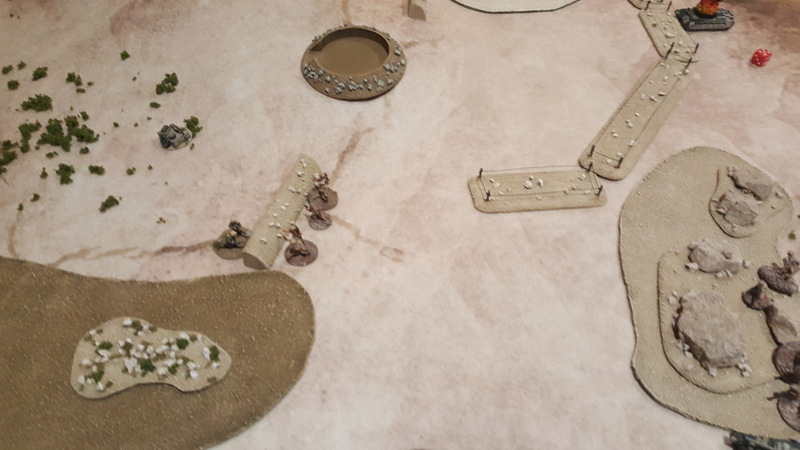 3" Mortars wipe-out the German Artillery FO on turn 1! 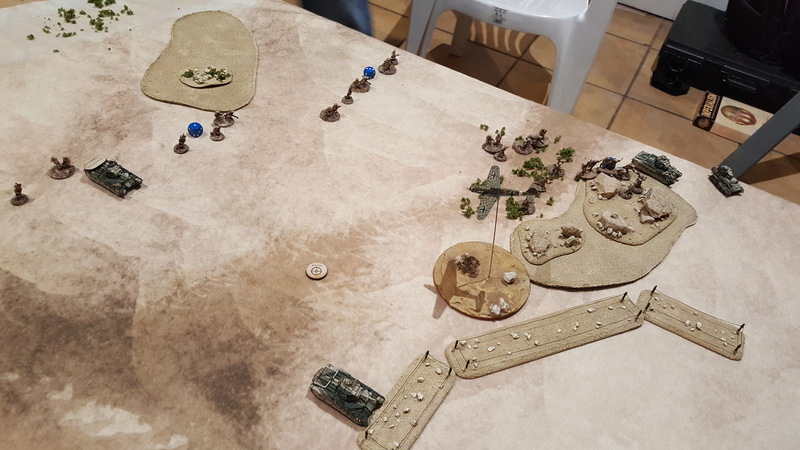 PaK38s vs. Matildas: the tanks take hits and some are pinned, but the armour proves pak-proof for the moment. 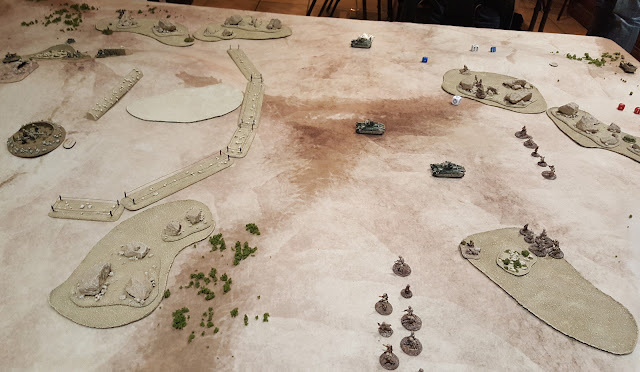 Highlanders push up the British left, but in the centre progress is slow as German artillery pins and inflicts a few casaulties. 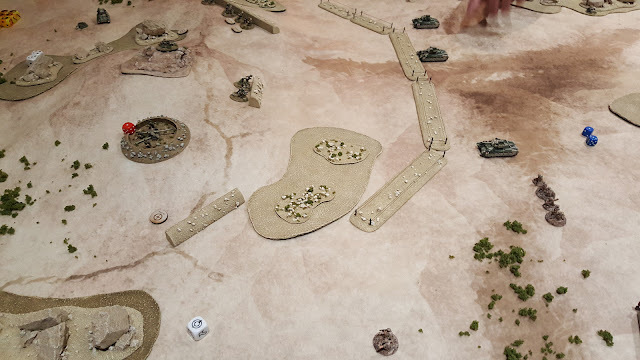 A lone Matilda, having just wiped out a PaK38 crew, now moves on to the PaK36. The British flank attack arrives, this time on their left...another platoon of Highlanders and a Vicker Mk. VI b. The PaK36 is quickly eliminated. The Luftwaffe arrives! The Germans successfully bring in a Stuka (cunningly disguised as a Bf 109 here...). It bombs the British attack and a direct hit on the Matilda near the wire sees it knocked-out. A second PaK36 arriving from reserve then KO's the Vickers light tank and MG fire thins out the British infantry. Artillery at the rear immobilises a British Matilda, while another breaks down on the far right, leaving just one tank mobile! 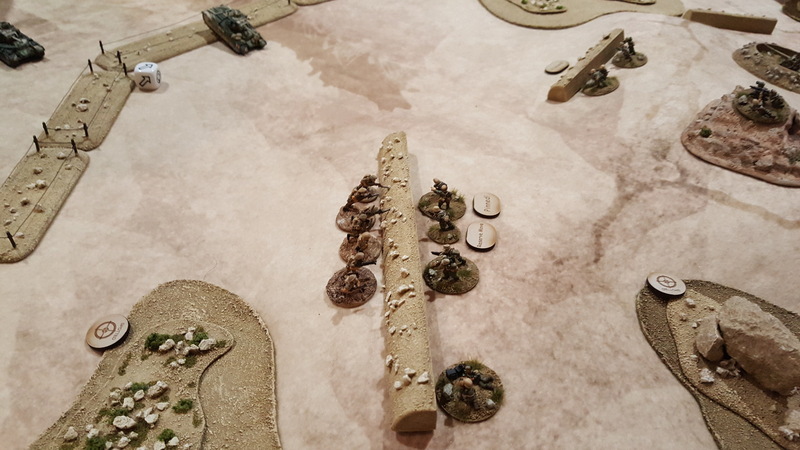 A Rifle section bayonet charges the nearest trench, but both units break after taking severe casualties. British Morale is taking a beating. The RAF makes an appearance and bombs some German infantry. More German chits to draw....things are getting close! 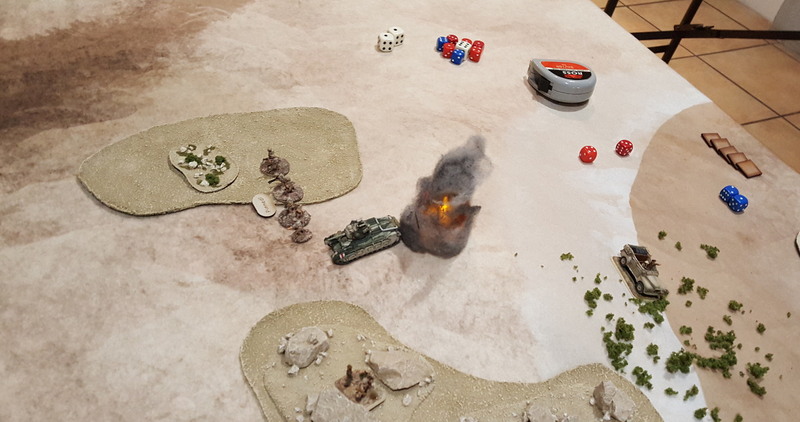 In the British turn, the tanks can see nothing, the strafing run by the P40 fails and the 3" mortars contribute little. It's up to the infantry: accurate long-range Bren and Rifle fire wipes-out another German infantry unit. 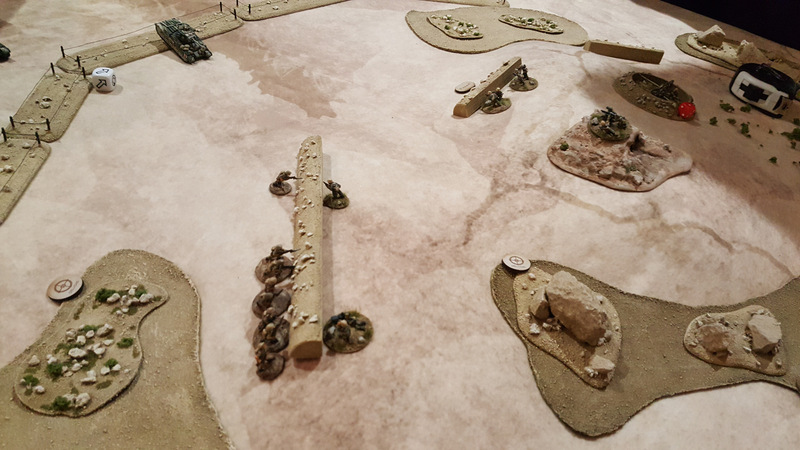 Commeth the hour, commeth the (Scots)man: the Rifle Platoon HQ bayonet charges the last survivors in the German trenchline. 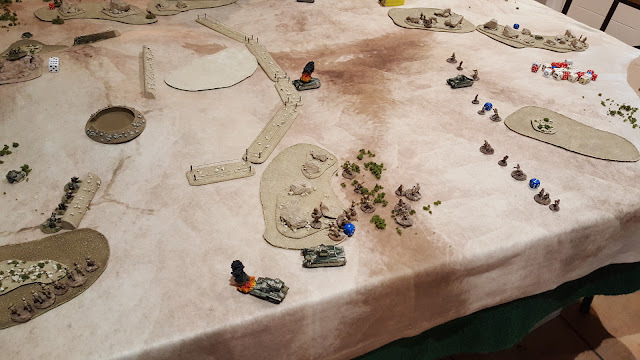 Taking two casualties on the way in they roll two 6s for saves and wipe-out the defenders! 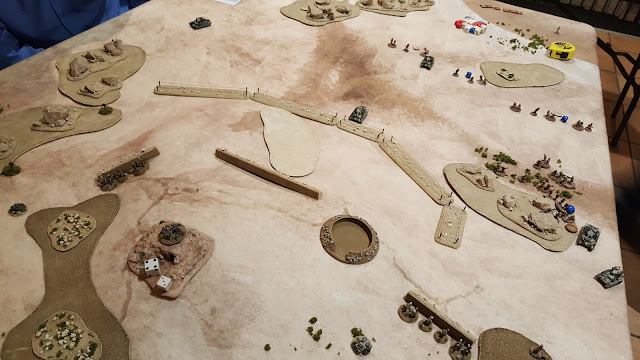 A much closer game: the British forces took a beating and were almost done, but some last-minute accurate gunfire and a heroic charge saw the Germans reach their break point first. 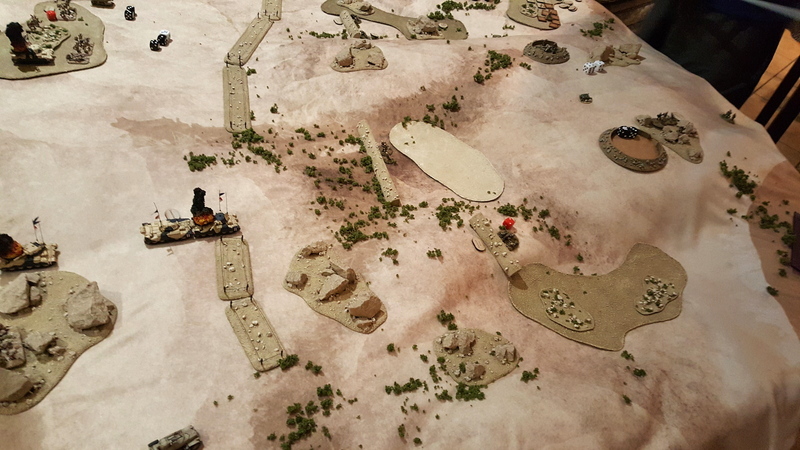 The result is a Minor British victory and sees the 6 Oasis Bn destroyed entirely while the 33. Panzerjäger unit degraded. 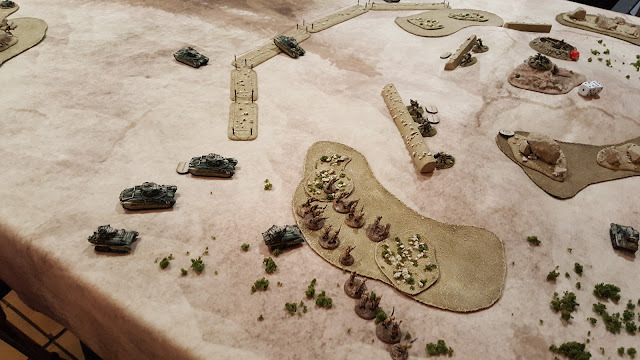 Remaining German forces must retreat from Pt. 206, but I'll cover that later when detailing Turn 2 of the campaign. 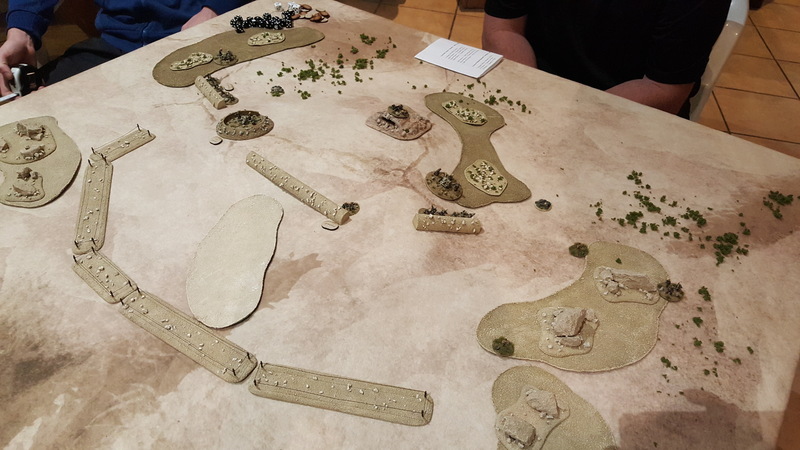 For the second game of the Operation Battleaxe campaign the British 7 RTR Group [7 RTR, 4 RTR, 22 Gds Brigade and 65 AT] attacked Pt. 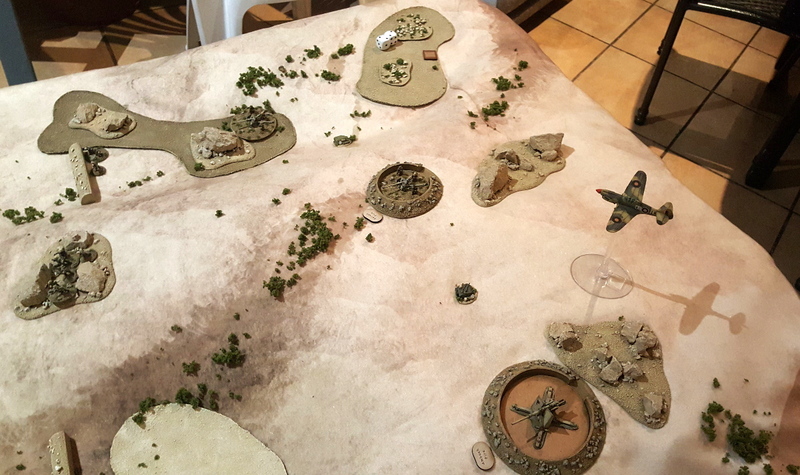 206 in overwhelming force, with artillery and (potentially) air support. After the lacklustre attack on Pt. 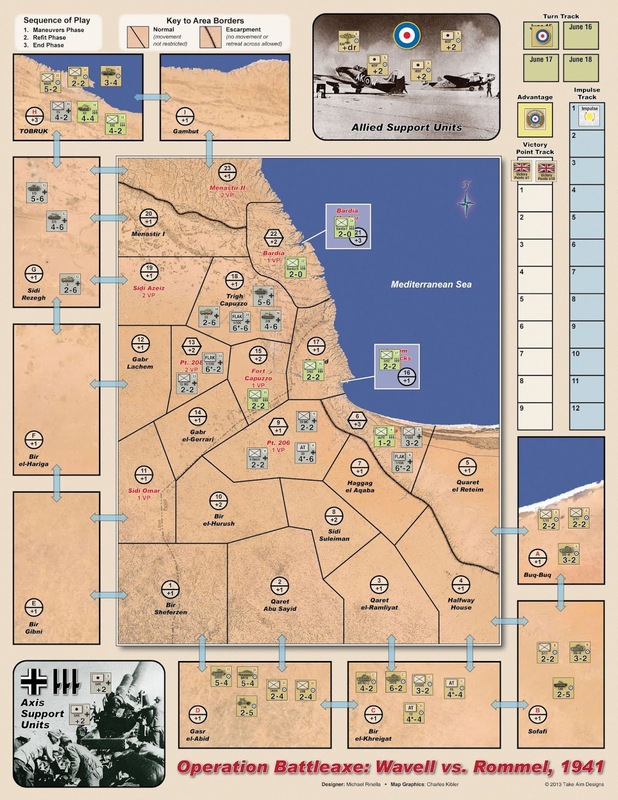 208/Hafid Ridge last time, some success was sorely needed here if their campaign had any hope of progressing. Using the Strongpoint Assault mission, the British force would be tasked with eliminating a German strongpoint. 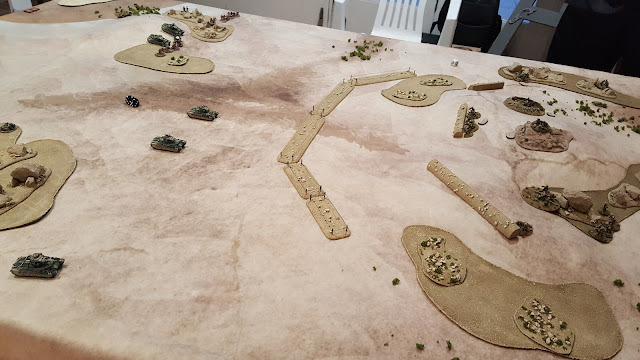 Having significant advantage in Combat Points thanks to the units involved, the British would be attacking with 500 Pts vs. a German defence of 350 Pts...a tough ask for the defenders, doubly so when facing concentrated Matilda IIs and having no 8.8cm for easy counters. 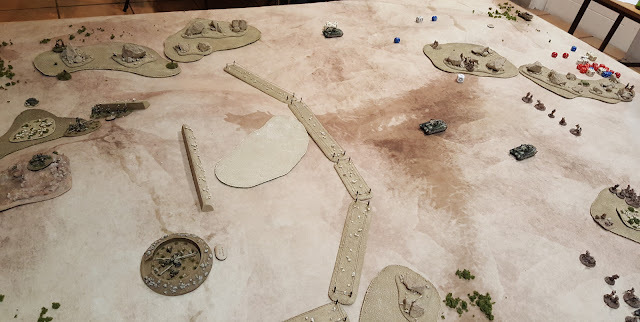 Their best hope was not to win outright (which was unlikely), but to hopefully at least damage the British attack and hope for better results facing the B-Sqn/Cameron Highlanders attack to the east. The British attacked across a broad front with two Motor Platoons, six Matilda IIs and three Vickers Mk. VI B, plus artillery and 3" mortars....ouch. 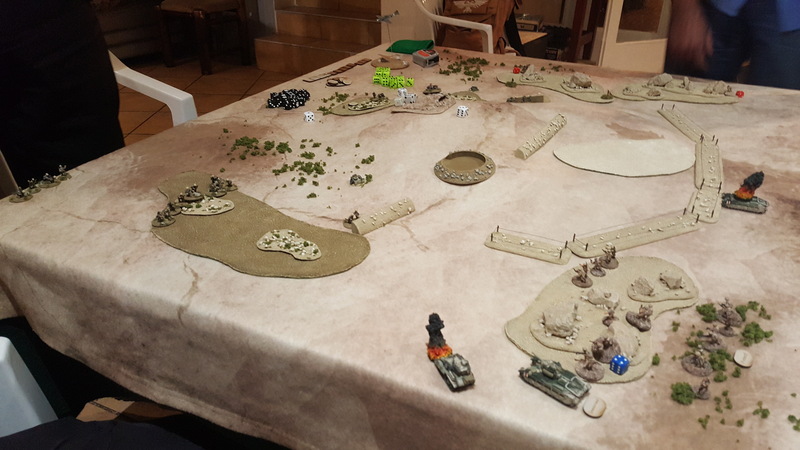 The German left: defences deployed, but troop are thin on the ground. KO's a Matilda II with a direct hit! The Matildas trundle forward firing their MGs as they go, with some effect. 3" Mortar bombardments slowly inflict casualties on the defenders. Matildas trundle more (5" move is slooooow...). though they manage to immobilise a Matilda before the PaK38 crew is wiped-out by 25-pounder shells. 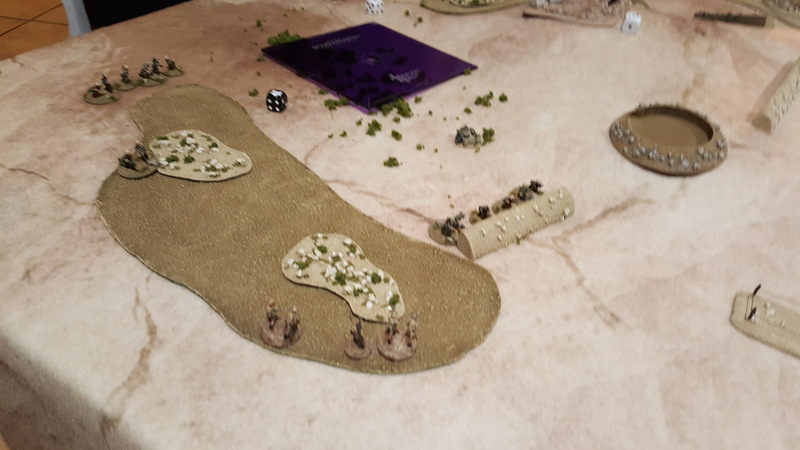 On the German right, the PaK38 trades shots with Matildas but cannot beat their thick armour. 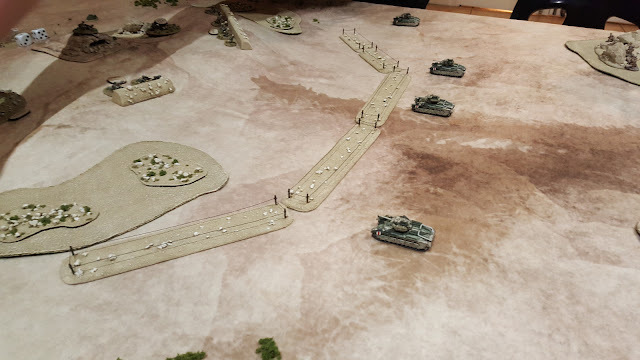 The British flank attack at full strength: it will take some doing to stop this lot! remarkably roll a Beyond the Call of Duty test and immediately counter-attack! This inflicts six British casualties for one of their own. Both units are reduced to a single man, though neither breaks. 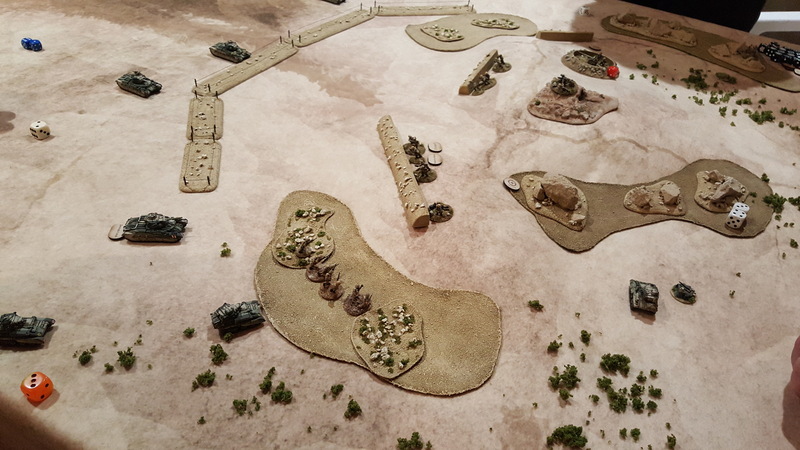 However a second section assaults and wipes out the Germans FO team, breaking the German force! 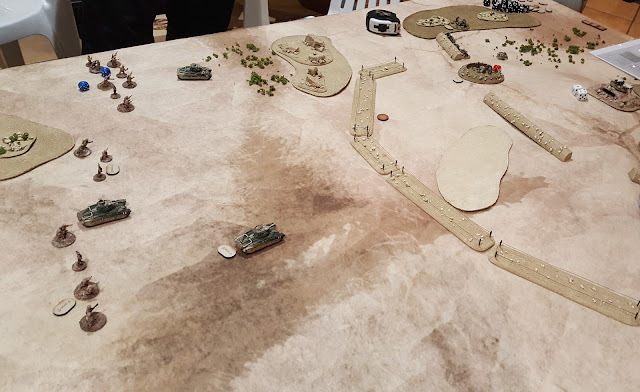 A pretty one-sided game as the Germans had (mostly) rubbish dice and terrible chit draws, while the British pretty much lit-up everything they fired at. The result is a Major British victory and sees German infantry units (6 Oasis Bn and 15 MC Bn) both degraded due to losses. With this game being so quick, we immediately played the Second British Attack on Pt 208 involving the Cameron Highlanders and 'B' Sqn, 4 RTR. 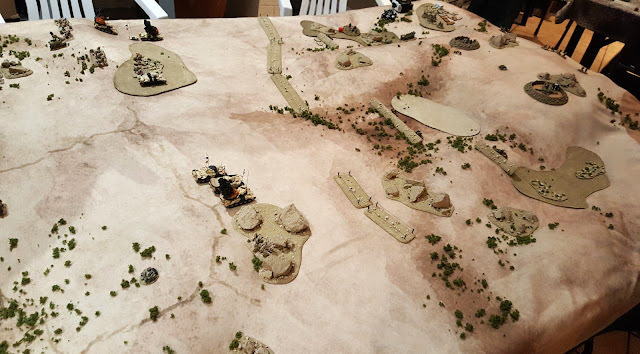 The first game to be played was the attack on Point 206. by the 6 RTR Group. This consisted of the 6th Royal Tank Regiment (newly-equipped with Crusader Mk. I), with support provided by 2nd Battalion, The Rifle Brigade, the 11th Hussars and 12th Anti-tank Regiment. Artillery suppoort was also available (2x off-table 25-pounders, 4+ Comms Test). The German defenders could count on a solid core of defending Shützen with support from numerous anti-tank guns, including PaK38s and 8.8cm FlaK, and some defences. Pt. 208, the Hafid Ridge...or at least the first ridgeline. 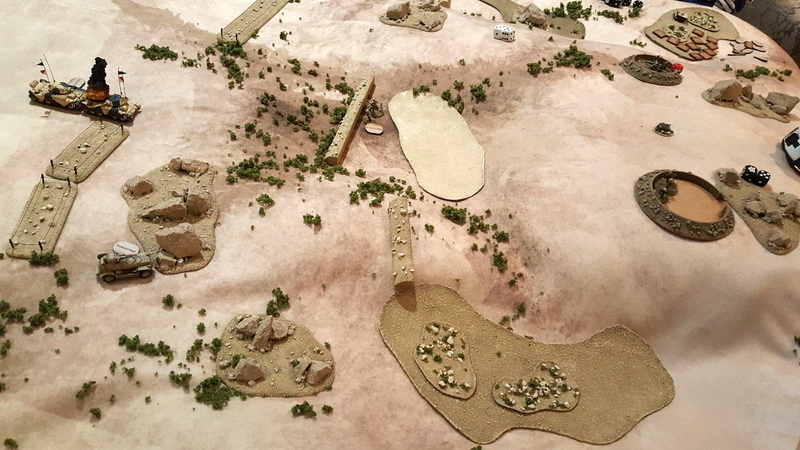 The British would be attacking in a slightly modified High Ground mission. They deployed their Motor Infantry and observers as a probing force, leaving the tanks to come on in the second wave. The Germans forces deployed a thin screen of infantry with plenty of MG, plus a pair of PaK38s and a single 88. British bottom left, Germans top of the ridge. A timed airstrike kicked off proceedings, successfully pinning the 88 but not much else. ...taking a few casualties from MG fire. Sporadic 25-pounder stonks did little. British reserves arrive as the Crusaders roar forward. A few Germans fall to long-range Bren and rifle fire. The attack is split into two...will it work? A German timed 8cm Mortar barrage strikes near the (far-too-clumped-up) Crusaders and succeeds in pinning one and knocking-out a second! On the left, the German ATGs open up to deadly effect...half the British armour burns. 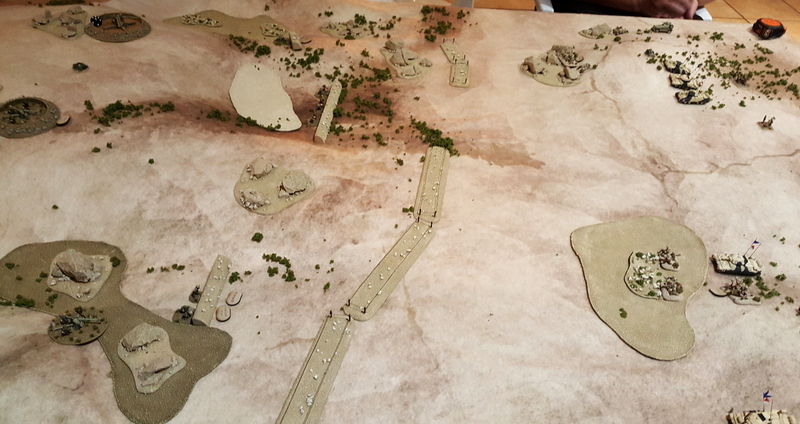 Retaliation is swift as 25-pounder rounds bracket the PaK36 and 38, causing several casualties and eliminating a few infantry as well. On the right, the British succeed in eliminating the 88, but lose another tank in the process while the other breaks-down. A German HMG, down to a single man, keeps the British infantry in place with heavy fire. On the left, the last Crusader is KO'd by PaK38 fire, but artillery strikes then eliminate the PaK38s and the PaK36 and inflict serious casualties on the German infantry to which Bren and Rifle fire adds more. The German forces take a beating, but they've stopped the armour: can the British force the position with infantry? As it happens: no. The last British vehicle breaks-down (but eliminates that damned HMG!) 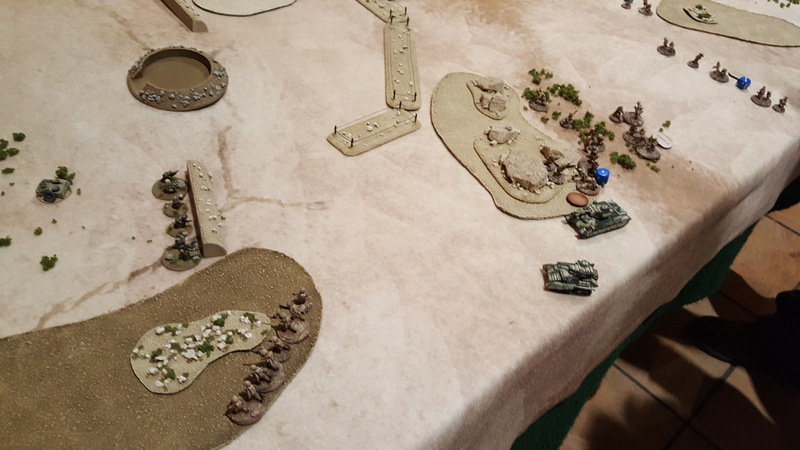 and the infantry cannot get moving in the face of MG fire. 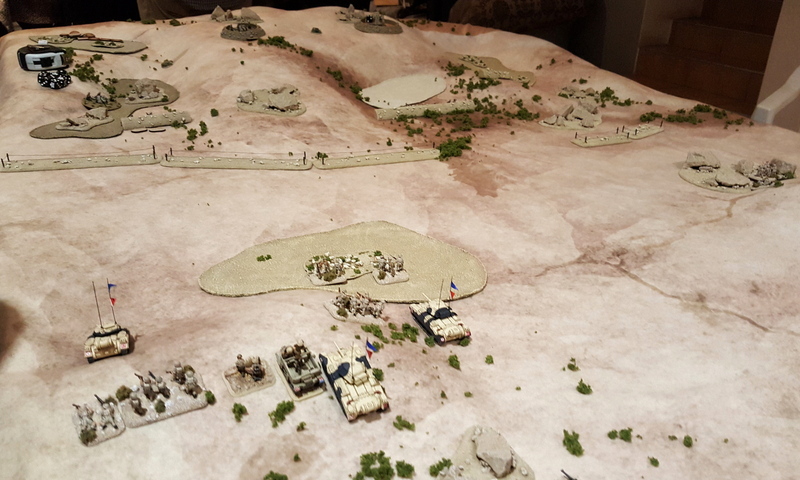 The British attack is called off: the DAK defense has held...just, with only ten men left un-wounded on the entire ridge! Again, another cracking game of Battlegroup. Despite losing most of their armour, the British still managed to inflict considerable damage in return but it proved too little, too late. The first British attack on Pt. 208 has thus failed, and they must take Pt. 206 in the next two games to have any real chance of damaging the German defences. 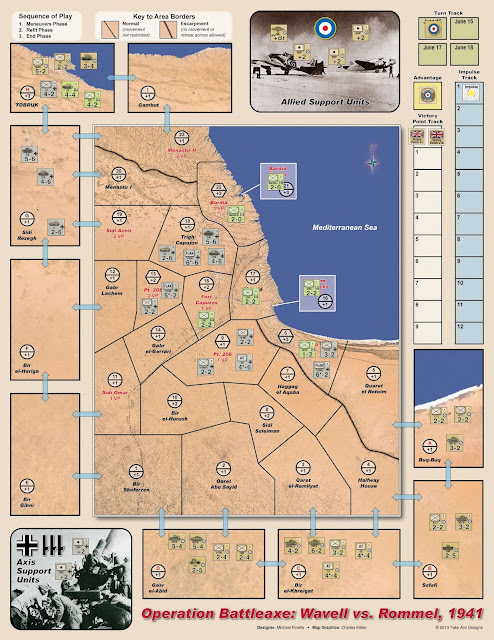 I have divided the campaign into six turns, a morning phase and an afternoon phase each for June 15th-17th. 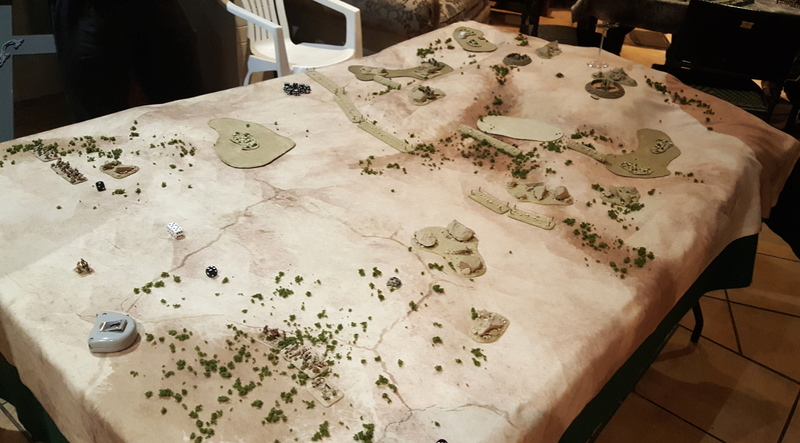 Turn 1 sees the British and Commonwealth units assume their real-life start positions while the Axis hold theirs: from there the respective commanders may move as they please (with certain restrictions), though the real-life objectives are obviously worth taking. 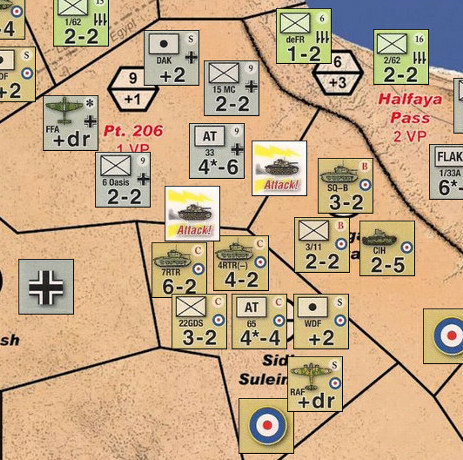 To win, the British forces must have secured an uncontested line of territories to Tobruk and hold it at the end of the game, or they must secure 10x Victory Points which will be sufficient to cause the Axis to withdraw. The Axis must stop them. Because the Axis forces have fuel shortages, they may not move their armoured and mechanised units on the first day (June 15, Turns 1 & 2), unless a German strong-point falls to British attack: Rommel is then sure that it is a major offensive and the Panzer and their their precious fuel reserves will be unleashed. If no strong-point falls, then they are automatically released from June 16th onward (Turn 3). To begin, the British commander moves his units onto the centre map territories with the deployment restrictions indicated on the map: from there he will begin activating units and launching his attacks. 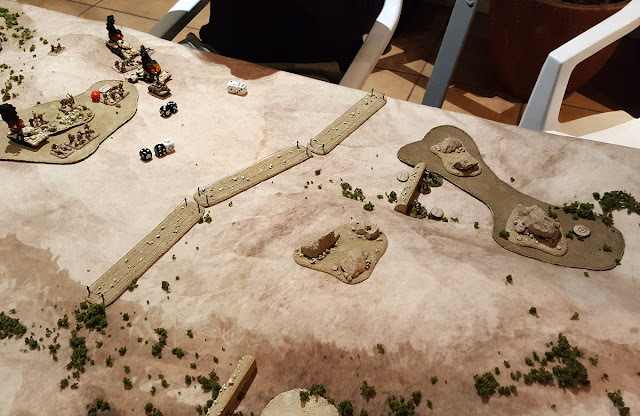 The Axis cannot do very much initially as the units occupying the strong-points (Halfaya Pass, Point 206 and Point 208) may not voluntarily leave them. They must in effect weather the storm and wait for the armoured counter-attack to relive them in later turns. 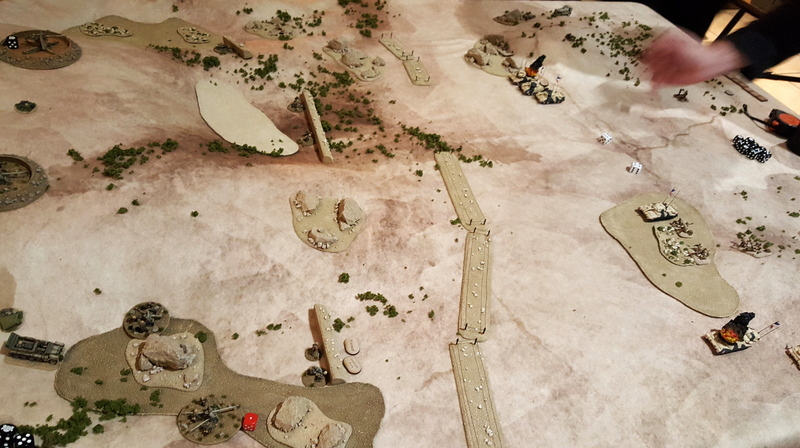 The British on Turn 1 have effectively launched three main attacks: the 6 RTR Group will attack Pt. 208, the 7th RTR Group will attack Pt. 206, while the SQ-B Group will do the same as a supporting attack. Any air and artillery assets have been allocated and from here the games will be played. Introducing "Operation Battleaxe - A Battlegroup WWII Campaign"
The project for the rest of the year for the local Battlegroup gaming group will be a campaign centred on Operation Battleaxe, June 1941 and run by yours truly. We'll be using the Battlegroup WWII rules in 15mm and drawing forces from the BG Tobruk supplement, with a few additions and our usual house rules. 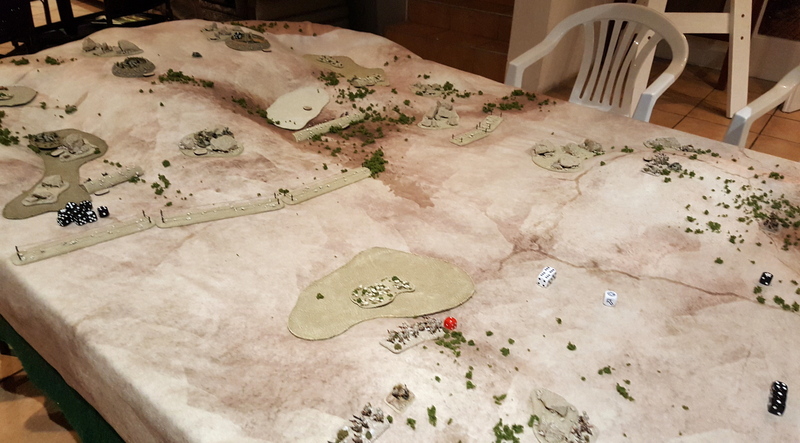 For the campaign itself I've used the map and units from the excellent Operation Battleaxe: Wavell vs. Rommel 1941 board game as a guide and, using a hard copy of that and an electronic version on VASSAL, have worked out simple campaign rules to integrate battle played out on the table top. After successfully defeating the Italian forces in North Africa, the entry of German forces to the North African conflict has seen the fortunes of British and Commonwealth forces reversed: Tobruk was surrounded and besieged. The Greek expedition, taking valuable forces from the desert that were sorely needed, ended in failure: Crete soon followed. Operation Brevity succeeded for a short time but then too failed in the face of strong German counterattacks: Halfaya Pass was lost, Tobruk remains besieged yet defiant. The fate of the North African Campaign hangs in the balance. But all is not lost: at great risk reinforcements were dispatched from Britain through the Mediterranean to arrive in Egypt: new tanks, aircraft and equipment in numbers that will allow an advantage to be gained and a new battle to be fought. Thus was born OPERATION BATTLEAXE. Yet machines and men are not sufficient alone, for the leadership to effectively wield these forces too must be found...a new hero rises, one who will take command of British forces, relieve Tobruk and drive the damnable Hun from the African shores once and for all. Mike B...is not that man. But he'll give it his best shot. ...but he wasn't available, so you'll have to do with Charles B instead. No Air Supremacy: the British mustered slightly more aircraft for the battle than the Axis thanks to the latter being concerned with taking Tobruk and operations elsewhere in the Mediterranean. 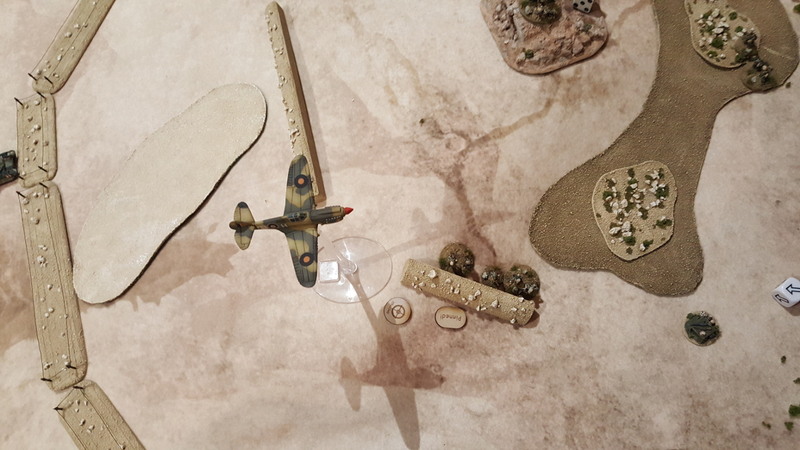 Consequently both sides gain Aircraft after drawing an Air Attack chit on a roll of 5+ during the campaign as per the rule book. If the Air Support token is present, this will succeed on a roll of 3+ instead to represent the major air effort being concentrated in that territory. German Low Fuel Restriction: due to a lack of fuel, Rommel will not commit German armoured and mecahnised units unless he is certain that a major attack is underway. To reflect this, no German tank or mechanised chit may move on June 15, unless at least one of the following territories falls to British attack: (13) Pt. 208, (15) Fort Capuzzo, (9) Pt. 206, or (6)Halfaya Pass. German Armoured and Mechanised chits may move freely if one of these territories falls on June 15, or from June 16 onward. German Stützpunkt: the Axis territories (13) Pt. 208, (9) Pt. 206, (6)Halfaya Pass and (22) Bardia are considered fortified positions or Stüzpunkt. Units within these territories may not voluntarily move or abandon them, they have orders to hold at all costs. 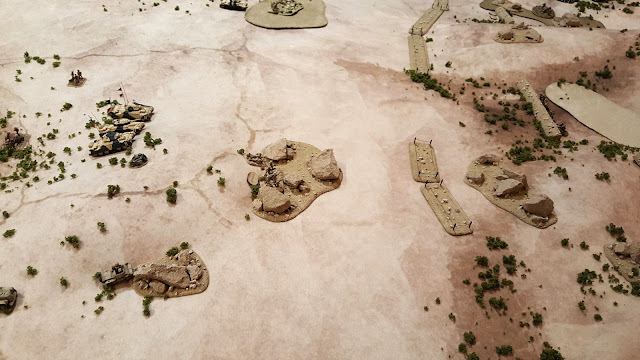 However these territories will gain free fortifications for each battle until they fall, thereafter the bonus is lost even if retaken at a later stage in the campaign. 1. You may not take any scout units unless you also have a Reconnaissance chit involved in the engagement. For the British, this is the 11th Hussars and Central India Horse chits, for the Germans, the 3. and 33. Aüfklärungs Abteilung chits. 2. Panzer restrictions - A German force must include fewer up-armoured Panzer III H or J and Panzer IV E than base models (Panzer III G and Panzer IV D respectively). 3. The British may not field any Crusader IIs, Valentine IIs, M3 'Honey' Stuarts, Humber Armoured Cars, Vickers Mk VI C (with 15mm HMG), nor any captured tanks. 4. 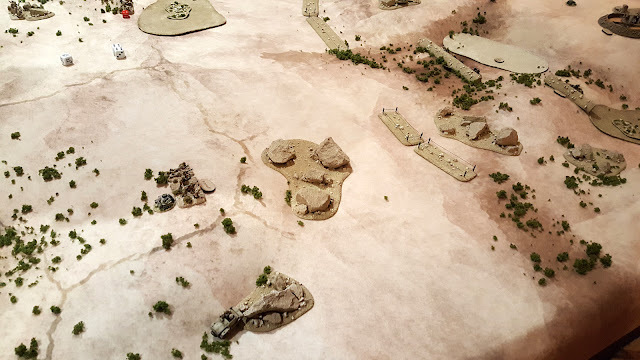 The British may not field Long Range Desert Group (LRDG) units. 5. The Germans may not field any captured tanks. Max 1x Panzer IV Platoon in any army. 12th KRR and 2 RB - Motor Infantry Battalions, may field: Motor Infantry Platoons, Carrier Sections, 2-pounder and Bofors Portees, 3" Mortars, Breda AA Portee. 1-3/11 and 22 Guards - Rifle Battalions, may field: Rifle Platoons, Carrier Sections, 2-pounder and Bofors Portees, 3" Mortars, Breda AA Portee. 11th Hussars and CIH (Central India Horse) - predominantly Marmon-Herringtons. British AT units (12th and 65th) - 2-pounders, Portees, single 18/25-pdr or 25-pdr guns.